But the idea of a macro mission is good. It adds dynamic to a typically-micro campaign. I dont remember if u did this already but have you considered fusing a macro mission and a micro mission together. I'm doing that with the second mission on my campaign to make it a lot longer. Here, these is the hints they gave how to complete the map [attachment]. Goodluck , and do let me know how it goes. You also find it very difficult? Hmm I go work on it right now, and try to balance it even further. Actually I did, the M06 is mix of makro and mikro. After you finish the Makro you get to do Mikro and boss fight. The new version is up, hopefully it is balance enough. Just uploaded my test playthrough of M6 (before the latest patch). I managed it beat it, but it was very difficult. I also just wanted to add a link to the playlist if anyone wants to check it out. Hammer of Dawn Beta Test Playlist Also, remember that my opinions on things are just that, opinions, and I don't mind at all if people think differently about things. That's why the more feedback the better since everyone has different perspectives. Thank you for the video. I was also cheering at 1:11:11. It really give me different perspective. I'd assume if you had play the latest version 6.1 you might have different experience with it. Hope to see more video from you. Still can't figure out what cause the bugs, sometimes they just ignore the triggers to attack point X after Y seconds with Z unit, repeat. They just stand there at the base and wait until have enough Z unit to initiate attack. As if they have minds of their own, scary. Perhaps have something to do with nova corpse? I don't know. I give it a try later tonight. If still no solution I have to do the AI from scraps. Do what you can, but don't kill yourself over it. There's usually a workaround. I assume bugs at the above attachment is probably what you and DudkiSC2 experience. In my opinion it isn't game-breaking so I'm okay with it until it's fixed. For me, I only consider a bug a serious issue if it's game-breaking or distracting. Otherwise, other bugs aren't a big deal to me. Mission 06 Last Remnant Version 6.2 is up. Thank you for all the feedbacks. Alright EDHRIANO, just finished the mission! Really fun. The fact that enemies keep getting rebuild to a base that you’ve destroyed, combined with your limited number of resources makes this mission pretty unique and fun to play. The fact that Command Centers can’t lift off forces you to save up so you can build a new one. I was actually out of resources when I needed to build a CC but luckily I found some resources lying around. Phew! I played on Hard, and I felt like the bases weren’t much of a threat later on. I think for the two bases at the Left and the right you could add some more units. Maybe more Air units, as you anti-air capabilities aren’t the greatest. This could increase the difficulty pushing somewhat. Your boss battles are difficult as always. As usual, it took me several tries to beat. I really enjoyed it, although the only real problem I had was that he used the Psionic Orb way too frequently, and combined with the grab ability, it’s so easy to lose. Other than that, if you manage your abilities carefully, you should be able to survive. It took practice, and it paid off which I really liked. The story is slowly getting more interesting. We are starting to get more info about Kaiser and there is clear progression. Keep it up! Bugs: Cobra Commander, Storm Shadow, Baroness, Medics and Firebats all gain doubled upgrades for every armor and weapon upgrade you get. For some reason, all campaign specific units gain an additional bonus to infantry upgrades, for example, +1 for Marines becomes +2 for Medics, as inside the upgrades they gain +1 twice. That’s something that can be changed in the upgrades section. Glad you like it DudkiSC2. Waw on hard, that is cool. Hmm perhaps I script the AI to be to easy now? I know right, the felling of "Yes! I beat it!" after long hard (and sometimes many death) boss fight is just so amazing. I didn't notice that that was a bugs, I just assume it was game feature. Thanks for the report. Awesome Jay , looks forward to it. Nah don't worry, won't get ambush by 100 Zergs, only 1000 now lol . Mission 06 have been getting lots of feedback thanks to the bi - weekly testing. Once it is finish I'll be getting back to work on mission 07 - 10. Thanks for the feedback Hultmanable. Just played through the first three missions. 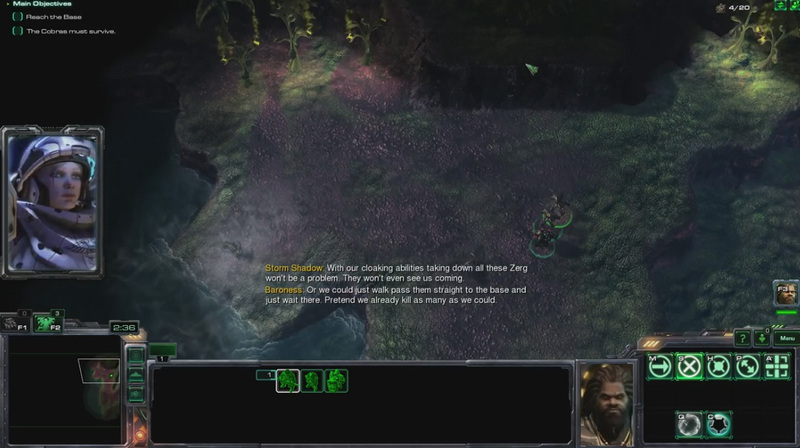 Mission 1 was pretty easy since we're dealing with mostly Zerglings. Between Psi-storm and Whirlwind, it wasn't really a big issue. The boss was annoying mostly due to positioning problems. It's really tall and any unit behind it won't be selected when you click on it because the boss is blocking your view. Other than that, it's all a matter of micro. Mission 2 was really tedious if you don't know what you're doing. 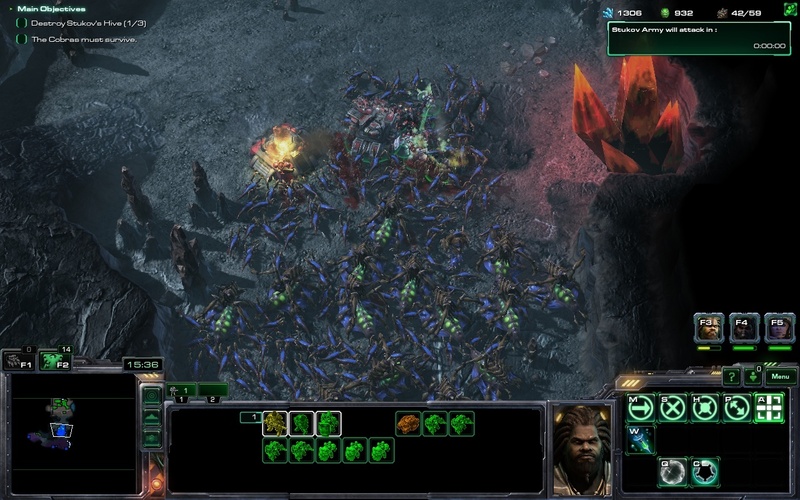 Reavers are a nightmare to face and since they're LotV Reavers, they can infinitely respawn their scarabs. In any case they can easily be dispatched with careful positioning. Kyra can stim in, blast it with a plasma gun, and back away towards Mira Kel while Ben Ar and Radamantis can move in and finish it off. As a side note, all of these characters are suddenly moving significantly faster than in the previous mission. I'm assuming it has to do with the fact that we're facing Reavers. Of the four I've played, this boss is the least interesting to me. It's literally just a more-dakka version of the Archangel fight from HotS. Though it did throw some curveballs. Occasionally, it had dickish shot placement (full-surround with no hope of escape) and had a tendency to target fire the medic. While I found that really annoying, it did make the fight more interesting. Similarly, that shock wave attack was a nice addition to its move set. Mission 3 was the easiest mission. Ben Ar now being ranged and dealing 30 damage with every attack is a major improvement. Similarly giving them that shield ability makes for a great addition to their move set. In any case, with all of that plus the enemies' slow movement speed, kiting them was child's play. I even ran past all the Ursadon Matriarchs you spawned at the end of the mission. The Elemental Dragon boss is my favorite of what I've played, with the second being Last Remnant. It's a bit dickish making it possible to lose the fight so early into it, though. If you let all three heroes get trapped, you're basically fucked. But ignoring that, it seems this boss follows a certain attack pattern with a relatively simple strategy for completing. Ben Ar's shield ability has a fairly long cool down but it can be timed so that its only used when necessary, which is when the Medic gets target fired. Kyra can tank if she's being targeted as long as she's at full health and constantly being healed so shields aren't necessary. Mira Kel is really squishy and can only heal herself for so much. As your tool tip said, use shields to save a life. Overall, fairly fun set of maps. The bosses are a little annoying but pretty enjoyable. Will definitely play these maps again. Wow you marathon all three? Cool. Originally it was much harder, but fellow mapster suggest might be good idea to tone it down. Since it might make many player decide to quit. Which leads to the creation of difficulty select (which turns out fine if I may say so myself). Hultmanable's pandora makes the creation of mission 02 possible. His map have the hardest micro and boss fight I've encounter at the time. Which makes it very memorable. At first I was just going to have the player explore the lab, enjoy few cutscene and lore before a boss fight. But it hits me that many might not enjoy reading that much soo I reduce the cutscene from 9 to 5 and add another section with the snow beast before boss fight. Glad you like it redlerred7 . Ohh you'd play it again? well I'd love to see a video playthrough of them.